Provider of high tech spray nozzles and accessories. Greenleaf's agricultural spray nozzles include AirMix, TurboDrop XL, TurboDrop DualFan. TurboDrop nozzles use Bernoulli’s principle to create a low pressure area which pulls air into the nozzle where it is mixed with the liquid stream to create larger air-filled droplets. Greenleaf Technologies was founded in 1985 by Bill Smart with the idea of bringing high tech spray equipment to the market. Bill Smart spent his whole life developing, tinkering with, and promoting advanced fluid handling technology. 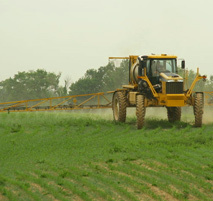 In 1995, a partnership was formed between Agrotop GmbH and Greenleaf Technologies whereby Greenleaf would promote and distribute the Agrotop spray technology product line in North America. Steffen Graef of Agrotop developed the TurboDrop nozzle in 1993 in response to the market need for an agricultural spray nozzle that would provide a combination of canopy penetration and coverage with contact chemicals that was previously not available. Since then Greenleaf has been the leader is sprayer technologies. Delta Precision Systems is your trusted Dealer and Installer of GreenleafTechnologies. Contact us today to get started. TurboDrop ® Asymmetrical DualFan adds a new dimension to high performance spraying. Multiple spray trajectories aim toward the target providing a unique combination of coverage, penetration and drift control. Lower maintenance is another benefit: it has a difficult to plug and easy to clean Venturi air injection design. The TurboDrop® TADF has become the nozzle of choice for coverage critical applications with contact herbicides, insecticides and fungicides. TurboDrop nozzles use Bernoulli’s principle to create a low pressure area which pulls air into the nozzle where it is mixed with the liquid stream to create larger air-filled droplets. The metering orifice determines the flow rate and thus the size of the nozzle. The exit orifice determines the spray pattern of the nozzle. Most spray nozzles have a single orifice that controls both the flow rate and the pattern. Therefore when the nozzle begins to wear, both the flow rate and pattern are affected negatively. With the TurboDrop the initial metering orifice takes most of the pressure, protecting the life of the pattern orifice to provide extended pattern uniformity and prevent striping, which can be a major issue on golf course greens. The TurboDrop utilizes a large mixing chamber and a patented pulsation dampener to produce a more uniform spray droplet spectrum made up of air-energized droplets. The air inclusion is important in that it changes the physics of the spray droplet. Air-filled droplets tend to spread out or collapse on the leaf surface rather than just running off, like big, solid-liquid droplets do. Additionally, having air-filled droplets means that there are more droplets in the spray to hit the intended target.